Comprehensive website for national training company. 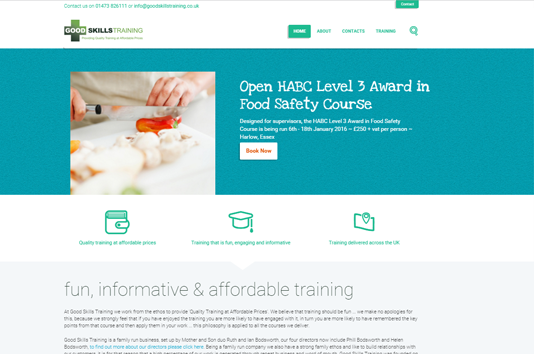 Good Skills Training Ltd provides national training courses for food handling, health & safety and fire. These courses are either public or company based. Good Skills Training approached Toucan Internet initially to search engine optimise and market their original site online. Through increased organic search engine results the footfall to the original website increased. It soon became apparent that the original site was not converting the visitors at a high enough rate to either enquirers or customers. The solution was to build a new website that clearly displayed the benefits that Good Skills Training offer and listed all the courses in a clear logical fashion with good calls to action. This site has subsequently been superseded by a revised site to accommodate a responsive design. This site is fully managed by the customer and is underpinned by the Modx Revolution content management system. This maintains site integrity whilst giving the client full editorial access. The courses are maintained in a bespoke management control system. As the site was on a Modx platform the latest update was a reskinning exercise with the content remaining largely unchanged and provided by the Modx database backend.